As posters have said, nobody can compete with the breadth of knowledge available at Sheldon... but I would be happy to write a "top 10 tips for life with your bicycle" if people want? Pictures to go with it would be an added bonus for the mechanically inept among us, like me. Layout and stuff can be done by the Publishing pixies. I'd appreciate it as I've just got back onto two wheels. Albeit I've only done a few miles so far while I get to grips with these new fangled ez shift gears. But it's already made me realise how much I want to know stuff like do how do I adjust the deraileurs to get smooth running, are there wear indicators on brake blocks, do I need to maintain front suspension, can I change the 700x42 tyres that came on the bike with something more suited to roads? Probably all very obvious questions to someone who does this regularly but it's an area where I'm ignorant. I've got both those books and they are great (using them I've been able to do all our bike maintenance, even stripping down a sturmey archer 3 speed hub), but I agree that what's needed here is a basic get-you-started article for new/newly returned cyclists so that they don't have to go out & buy the books before they can even get down to the shops to get a pint of milk. Cool. I'll get on it. Might take a few days. I'll get on it. Might take a few days. 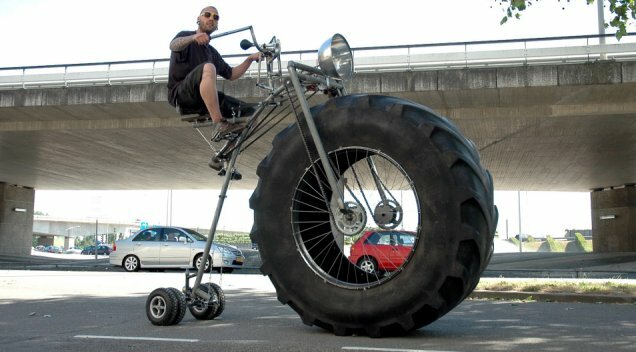 Have you got a really, really, really big pennyfarthing then? Do you still bother with tyre pumps and puncture repair kits? Did I just hear Cab squeal with delight?